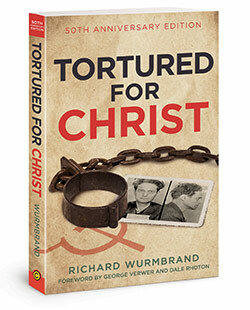 Pastor Richard Wurmbrand, whose body bore the scars of 14 years of torture and suffering for Christ in a Communist prison, witnessed the indomitable courage and persistent faith of many persecuted believers. Following his release from prison, he devoted his life to being a voice for persecuted Christians so others in the body of Christ might be inspired by their examples of bold faith. Available to U.S. residents only. Limit one per household. Canadian Residents, please proceed to this link. By submitting this form you agree to be contacted by email by The Voice of the Martyrs. Your information will never be sold or shared with another organization.